Rajni movies. They are a genre. It is a genre that has for decades catered to a very small but specific subset of the 1.2 billion Indians that live on this earth. Yet, the driving force behind this genre, the Super Star himself, the brand, extended his influence far into this universe. It was his universe and everyone else just lived in it. 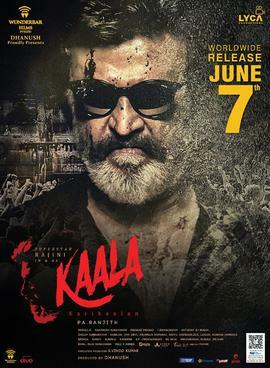 Kaala doesn’t quite fit into that genre. Kaala is the story of Dharavi, one of the largest slums in the world, but situated right in the middle of Mumbai, the financial capital of India. Imagine if you could put a price on the land in central park. Dharavi is two-thirds the size, less than one square mile, with more than 700,000 people estimated to live within it. For them the small parcel of land is their home, their life, their birth right. Just outside, Mumbai is a city of mansions, of vanity buildings, of celebrities, of politicians, and home to some of the richest people on this planet. This is where the two worlds collide. A power hungry don Hari Dhadha with corrupt politicians in his pocket and puppet police wants to redevelop Dharavi. The people of Dharavi want a better condition of living but they fully understand the value of the land they inhabit and are not going to be bought out for cheap. Enter the Super Star, Kaala, a resident of Dharavi, a local hero (don) who has fought for and protected the rights of the people living there. A modern day Nayakan. He is also a husband to a strong Thirunelvi wife, father to four children and a grandfather to many kids who all live under his protection. The people of Dharavi respect his leadership and will lay down their lives for him. Who does the land belong to? What is the value of the land? What lengths will people go to for a piece of it? The answers to complex questions is never black or white. The violent fight between the rich who want power and the poor who want equality is the rest of the movie. The story is also told through the subplots of the power of protests in this Twitter and Facebook world, the return of an ex-lover and the emotions that it swirls and the family aspirations and conflicts of a well respected don. These add the human touch and are consistent with topics that today’s generation would relate to. Indian movies need song and dance and this movie had it but as part of the story. The music was rap based and it is a directorial decision. It worked for the story telling. The best part of the movie was the direction. I believe that details separate great directors from the rest. In one scene, where Kaala comes to meet Hari Dhadha, in the well furnished living room with white tapestry, bronze statues, plush sofas, a big screen tv, there lies next to it all a pink Barbie doll and a few children’s toys. As a father with two young girls, I know how their toys can be everywhere, even in my OCD governed, sacred living room space. The last scene was another favorite. Black and White merges into an explosion of color. This is India, a country of extremes but nothing is black or white, and unlike the common belief that everything is shades of gray, in India it is hundreds of colors. I did, think that there was a little bit of The Last Jedi in the ending. The explosion of color (not just red) and the concept of everyone or anyone can be the next Kaala. In the end, we left the movie in deep thought. How do you solve Dharavi? Does it even need a solution? What is our purpose in life? What is our cause to fight? This was a good movie, I enjoyed it as a movie, but I went to see a Rajni movie, and this was a Rajni movie that made you think and I am not quite sure how I feel about that yet. Previous Samsung S9+ – The Camera. Reimagined. 10 Use Cases to test the theory. Good post! While on this pls read my post – Tamil Cinema’s Masssss… trap!